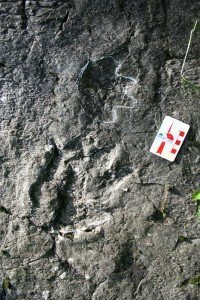 These are the first reptiles footprints in Lombardy that date back to the era of the dinosaurs, the largest and best preserved in Italy. Not only that, according to experts, they also help in dating rocks and fossils found in other places around the planet; in this way, they help to understand the evolution of reptiles which then became dinosaurs. Although known for some time to the inhabitants of Zone, only recently they came under the eyes of scholars, composed by experts from the Natural History Museum of Milan, from the Trento Museum of Natural Sciences, the Museum of Natural Sciences and in Brescia andUniversity "La Sapienza" in Rome. It is composed by five progression of steps ("tracks" is the term used by paleontologists) crossing in different directions two layers of rock almost vertical, on a total area of about 50 square meters. 220 million years ago these layers were part of a vast mudflat crossed by rivers flowing into the low tropical sea. 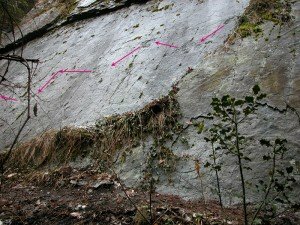 About 15 million years ago, when the Alps began to fold, the old deposits which have become rock were raised and arranged vertically so as we see them today. All the tracks are related to four-legged animals, plantigrade or semi-plantigrade, long from 2 to 6 meters. Animals that had a walk very narrow and quite linear, therefore a body structure with arts positioned vertically under the body. The front legs were smaller than rear and the hands rested on the ground with a characteristic rotation on regard to the foot. In the best preserved footprints we can clearly count 5 fingers on each hand or foot, observe the marks left by claws, and also roughly outline the fingertips and heels. 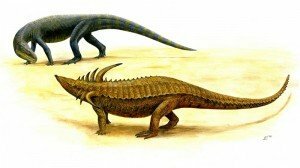 Since we do not hold the skeletons of the animals that lived in the Triassic, it was not possible to identify with certainty what animal correlate.